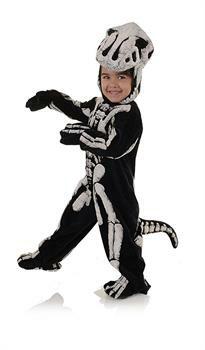 Your little one will have a blast wearing this awesome Dinosaur Skeleton Child Costume! This dino fossil costume features a cracked bone 3D puffed printed jumpsuit with attached feet. Complete your look with the included detailed plush hood and mitts. Made from a lightweight baby blanket material. Spacious enough to pull over warm clothes during cold weather. Hand Wash/Line Dry. Do not iron. Perfect for Halloween, themed family photos, parties, and any other dress up occasion.